Call of the Forsaken is EverQuest's 20th expansion pack! This expansion had staggered content release, similar to the Rain of Fear expansion. There were 3 content releases in addition to the initial expansion launch content. The initial content release is referred to as "Tier 1-A", the second content release is referred to as "Tier 1-B". The third content release was a single zone, Tower of Rot, and the fourth and final content release was a single zone, Argin-Hiz. 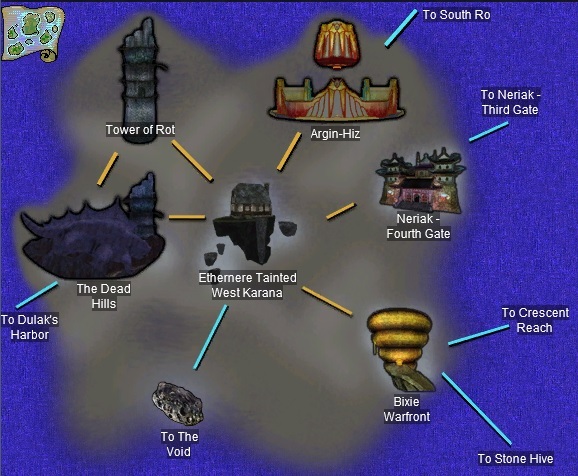 Both Tower of Rot and Argin-Hiz are Tier 2 zones. Brand new Mercenary Alternate Advancement system. Mercenaries can now equip gear and become more powerful! Gather your friends and embark on epic new Heroic Adventures - Missions that are tailored to your group! Share more phat loots with alts via 2 new shared bank slots! New Spells & Skills, Alternate Advancements, and Gear! New Raids, Tradeskills, and brand new Hero's Forge Armor sets! The entry zone for Call of the Forsaken is Ethernere Tainted Western Karana. The zone in can be found in the old West Karana zone. There are portals in Ethernere that lead to the remaining Call of the Forsaken zones, but you will need to attune yourself to them beore you can use them. Attuning is similar to how it was done in Rain of Fear, but you do not need to get a quest to do the attuning. Simply enter any of the new zones through their normal entry points (you can use the zone finder feature in EQ to help you). Once inside, click the Ethernere portal. Congrats, you are now attuned for that zone! Call of the Forsaken does not have any group flagging. All of the zones are open on day 1. All spells and AA's are also unlocked on day 1. You will need to complete quests in each of the zones in order to request the raids.